Vegan Hearth Breads are hearty, rustic, free form breads that are baked in the hearth or floor of the oven. 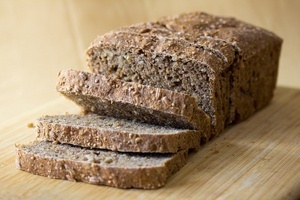 These types of breads utilize mostly simple ingredients in their recipes such as flour, water, yeast and salt which usually allows them to be vegan by default. Hearth breads usually showcase the art of extracting as much flavor from these simple ingredients as possible by utilizing advanced yeast leavening techniques and higher baking temperatures. Hearth breads are known as the opposite of enriched breads which usually rely on other food additives such as sugars and fats to build flavor. A recipe from my book Triumph of the Lentil, this is my staple bread recipe. Even with a newborn and a toddler to look after I manage to bake this twice a week, so that we never have to buy bread. Because of the slow rising time it requires very minimal kneading (only enough to mix in the flour), doesn’t require any oil or sugar to taste good and stays fresh for longer. The slow rise develops the gluten in the same way that kneading would, but results in a superior taste. Each rise can take between eight and twenty hours and put in the fridge at any stage, to be baked within two weeks. I like to make each rise around twelve hours. It can also be sped up a little, to make the total time as little as 16 hours by doubling the amount of yeast and combining the first and second rise together. 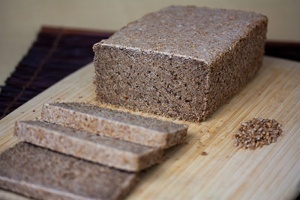 This Vegan Nine Grain Whole Wheat Bread recipe is unique in that it sports nine grains and contains 100% whole wheat flour for the rest of the ingredients which adds a superb flavor and texture not found in many other breads. Baking a bread with both of these features involves a little more effort but I think you'll agree that it's time well spent. This bread differs from a regular bread recipe in two ways: First, the grains are soaked so they soften and integrate into the loaf. Second, since we're using 100% whole wheat flour for the rest of the flour we need to soak it overnight so the bran softens. This softened bran will enable a more efficient rise because the bran won't cut gluten strands. It will also allow for a more supple crumb. These soaked flour and grains are technically referred to as, what else? A soaker. I suspect the bread baker who coined this term was having a creativity block the day he named this method. 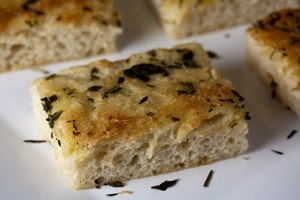 The secret to making great focaccia involves using an herbed olive oil to lend an array of herb flavors, allowing the dough to ferment in a refrigerated state for at least 12 hours which allows complex bread flavors to develop and baking a wet dough at a very high temperature which ensures a soft, spongy texture and a crispy crust. Fresh herbs are paramount to infusing the right intensity of flavors in this focaccia recipe. Feel free to use any combination of fresh basil, thyme, rosemary, oregano, sage, savory or marjoram. A long, refrigerated fermentation allows naturally occurring enzymes within the flour to break out more sugars from the starches for the yeast to ferment. These extra sugars allow the yeast to built more flavor, sweeten the focaccia and caramelize under heat which contributes a multitude of enhanced flavors. 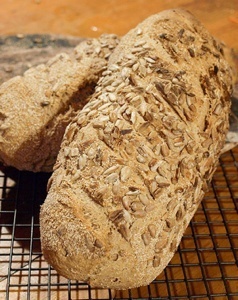 This Sprouted Wild Yeasted Whole Wheat Bread recipe is a nod to how the first breads probably got their start. Wheat berries were probably softened with water, ground and left out in the elements where they were then populated by airborne yeasts and bacteria, causing the dough to rise slightly. Placing this dough on hot rocks in or near a fire probably resulted in a fine vegan treat like nothing else available at the time.